Automotive and motorsports enthusiasts have been descending on the Monterey, California peninsula to enjoy some of the world's finest cars. The Pre-Reunion at Mazda Raceway Laguna Seca was the first event during classic car week and the two-day race kicked off the week in style. There were 312 vintage race cars in ten race groups preparing for the Rolex Monterey Motorsports race. The first car show of this hectic week was the Carmel-by-the-Sea Concours on the Avenue. 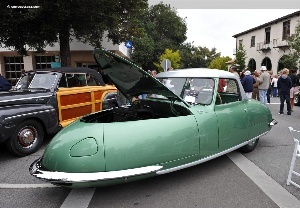 In years past, this event has spanned sixteen blocks of downtown Carmel with over two-hundred collector cars and motorcycles. This year - until recently - the event was canceled. In the eleventh hour, a team of a dozen volunteers worked aggressively to make the event happen. The result was a relaxed, scaled-down version of past years, with the show cars positioned on just a couple blocks of real estate. Past years have been a full day affair; this year it was two hours long. There was no judging and no awards handed out. Despite all of this, the event felt very well organized and orchestrated. Though a smaller group of cars than in past years, the organizers were able to recruit a number of quality machines. There was a row of Porsches, several Ferraris, a Maserati, and even a Citroen. Detroit power was also well represented, with a 427 Chevy Impala SS, Chevy Chevelle SS, Shelby Mustang 350H, and Pontiac GTO. A popular theme at previous years had been the micro-car display; this year was no different. The oddly shaped three-wheeled Davis Divan owned by TV personality Wayne Carini (who also brought a British Bus) was a popular attraction. The design was originally created by Frank Kurtis, later to be known for his Kurtis Kraft Indy race cars in the 1940s. After the War, Gary Davis put the car into production. Around 15 hand-built examples were created before various lawsuits brought production to an end. Thankfully, the organizers and volunteers were able to pull this event together, and there were many willing exhibitors ready to show-off there vehicles.